Many people who are convicted of a crime or plead guilty are placed on probation instead of going to jail. This can allow them to serve out their sentence while living at home and continuing their employment. However, probation comes with conditions. When a person violates the terms of his probation, the consequences can be more severe than the original punishment would have been. If you have been accused of violating your probation, you need an experienced criminal defense attorney who can help you fight the charges and minimize the consequences if the allegations are true. 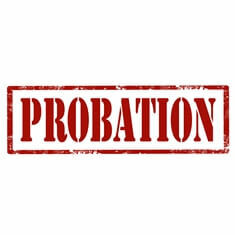 Probation is a set of rules that is part of the person’s sentence and must be followed either as a punishment or to avoid a harsher sentence. It is usually only available for minor crimes, such as misdemeanors or drug and alcohol offenses. Probation is generally not granted for serious crimes such as murder, kidnapping, or if the person has a long criminal history. Your probation period could be extended. Your probation could include new additional terms, such as a requirement to complete community service or attend drug or alcohol counseling. You could have to serve a short sentence in jail. Your probation could be revoked, and you could be required to serve all or part of your sentence in prison. Are There Defenses to a Violated Probation Claim? The prosecutor must prove that your violation of probation was intentional or caused by serious carelessness. Proving that you mistakenly violated a term of your probation is a common defense. If you honestly did not violate probation, an attorney can help you defend the charges by investigating the claim, interviewing witnesses, and obtaining documents as he would in defending the criminal charges against you. If you tested positive for alcohol or drug consumption, your attorney may hire an expert qualified to challenge the results of the testing conducted. If you have a drug or alcohol problem, your lawyer could recommend that you start drug or alcohol-related counseling and join a group such as Alcoholic Anonymous. While this does not defeat the claim that you violated probation, it will make you appear more sympathetic at your hearing. If you failed to pay your fines—a common violation—your attorney may be able to work out a new payment plan if you have a legitimate reason for not paying, such as a loss of a job or a family emergency. If you have a good reason for failing to complete a court-ordered program such as counseling or community service, your attorney may be able to raise this to defend against the claim you violated probation and ultimately resolve the issue with the prosecutor. If you are able to get back on track with the program before your hearing, this can also help your case. You do not want to face the potentially dire consequences of having your probation revoked and possibly being sentenced to prison on your own. If your probation officer gives you any warning about a probation violation or you are worried you will receive a warning soon, you should contact an experienced criminal defense attorney immediately. He or She can proactively help you solve your problem so that you do not face more serious consequences. If a hearing has already been scheduled on a charge of violating probation, an attorney is essential to building a defense to the accusations and negotiating a resolution to the violation—if you, in fact, violated a term of your probation. At Greenspun Shapiro PC, our attorneys are known for our experience, imagination, and tenacious defense of all of our clients. We have over 80 years of experience handling a variety of criminal matters, including probation violations. Call our law office in Fairfax, Virginia at 703-352-0100 to schedule your free consultation with one of our criminal defense attorneys.